There’s nothing like the first swim of the year in the ocean, and there’s nothing like surfing the waves when the weather changes. If you love windsurfing, traditional surfing, or even scuba diving, the you definitely need a wetsuit. For many men, finding the perfect wetsuit can become a lifelong pursuit, and many men end up compromising on some aspect of their wetsuit checklist because they haven’t done enough research to know what to look for. Don’t despair. With a little light reading and some quality control checks done by yours truly, you can get what you need, at a price you can afford, and get back to loving the water sooner than you think. Rounding up the best wetsuits for men, we’ve also put together a list of things to look for and pay attention to when trying on and shopping for wetsuits for your aquatic adventures. The Reactor is the best overall wetsuit for warm waters. As a leading wetsuit brand, O’Neill provides a variety of advantages to new and experienced water-sport enthusiasts. This stylish and high-quality wetsuit provides complete coverage for warmer water use. The one-piece design means water is less likely to make its way into the suit, so it will keep you warm. With the full-length zipper on the back, it is easy to put on and take off without assistance. The neck closure is also completely adjustable making this is a great option for men who prefer less restriction in their wetsuit. If you are looking for a thicker option, the O’Neill Epic wetsuit might be for you. This suit helps to insulate your chest and maintain your body heat, even in cooler weather and water. Made of Ultra Stretch neoprene this wetsuit provides extra durable coverage and comfort. The back zipper makes it easy to put on and take off the wetsuit. It features a wind-resistant firewall interior chest panel and for added warmth where you need it most. PREMIUM QUALITY - 3mm neoprene material is ideal for 65° F & up. DURABLE AND COMFORTABLE - Comfortable flat-lock stitching and anti-abrasion shoulder and knee pads provide extra strength. ULTRA FLEXIBLE - Super-stretch panels in the knee & armpit make it great for triathlon use. A high-quality, moderate thickness wetsuit for men that provides extra comfort for all-day wearing and enjoyment. The knees and armpits feature super-stretch material for better movement all day. The durable zippers offer easy on and off access. The shoulders and knees are equipped with anti-abrasion pads to provide extra protection in these areas. The extra long leash design has a tie down tab at the collar to ensure that it doesn’t get in your way. PREMIUM QUALITY - Nylon II neoprene material forms to your body like a second skin. ULTRA FLEXIBLE - Super-stretch armpit panels make for easy mobility. PREVENTS CHAFING - Flat-lock stitching prevents skin irritation. A leading brand in the outdoor lifestyle industry, Seavenger delivers high-quality products that are loved by outdoor enthusiasts all over the world. The Navigator is made of 3mm ultra flexible nylon II neoprene. It has panels in the armpit area that stretch when you move, so it will not hinder your swimming at all. With a #10 YKK zipper and an extra long leash, you can get in and out of your wetsuit on your own. The short sleeves and legs paired with anti-abrasion padding make it perfect for warm weather activities. This Volt is the best triathlon wetsuit available and it won’t take long to realize why. It is one of the stretchiest and versatile in our round-up review. The neoprene measures 3mm in thickness and provides a great fit. It comes with X-FLEX suit liner which stretches but returns to the original shape and fit. It is the perfect suit for triathlons as it keeps your arms free and unrestricted. This suit won’t slow you down either. The X-SLICE coating is unique to Xterra suits, and it helps to reduce drag while you are in the water. If you are looking for the best shorty wetsuit on the market, this is it. This wetsuit is specifically designed to be comfortable and warm. It has flat locked seams to reduce chafing, and the 2.5mm neoprene is thick but stretchy so it won’t restrict your movement in the water. The neckline is adjustable with the micro-teeth velcro fastener, so you can make sure to get the perfect fit and keep the water out of your suit. MULTI-USE: Designed to keep you warm in the coldest conditions for diving, paddleboarding, kiteboarding, wakeboarding, kayaking, canoeing and other water sports. DURABILITY: Spot taped at stress points and flatlock seams provide a smooth interior and exterior surface to ensure maximum comfort and durability. The Lemorecn full body wetsuit is a great suit for all types of water sports. The 3/2mm neoprene features a 3mm chest panel to keep you warm where it matters the most. The 2mm sleeves give you the movement you need in the water. The suit is spot taped at all stress points so that the suit will hold up to a lot of use. It has an extra long leash and is paired with a YKK zipper to make this suit easy to get into and out of without assistance. The flatlock seams will help to reduce any chafing that usually occurs at seam lines. A leading wetsuit brand, O’Neill Hammer Shorty provides a variety of advantages to new and experienced water-sport enthusiasts. This stylish and high-quality wetsuit provides medium-level coverage for warmer water use. One-piece design means water is less likely to make its way into the suit. Easy to put on and take off, this is a great option for men who prefer less restriction. ● Might not provide ideal sealing for cooler days on the water. A high-quality, moderate thickness wetsuit for men that provides extra comfort for all-day wearing and enjoyment. The high-quality zippers offer comfort and durability, and the shoulder and knee pads provide extra resistance in high traffic areas. A leading brand in the outdoor lifestyle industry, Patagonia delivers high-quality products that are loved by outdoor enthusiasts all over the world. This is one of the best wetsuits on the market, and it won’t take you long to find out why. It has been manufactured with a specifically designed biorubber that provides better elasticity for the wearer. This wetsuit is one of the stretchiest and versatile in our round-up review. It offers a zipper-free design, so there is no fussing when you want to get in the water fast. The neoprene is rated at E4 and measures 2mm in thickness. It is a great suit for cooler weather and can provide more warmth and stretch than most suits of this thickness. 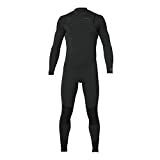 The long sleeves and short legs make this wetsuit great for changing weather conditions with warmer water. The TYR Hurricane Cat 5 wetsuit is the suit for athletes, triathletes and those who like to get in and out of the water multiple times a day or during events. This suit offers a variety of custom options that make it performance-based and ideal for those on the go. With unrestricted movement, athletes can go from water to land without changing and compete at high levels. ● While it would be suitable for men of all athletic abilities, the price point might not be attractive to the beginner swimmer, scuba diver, or surfer. When it comes to choosing the best wetsuit for your needs, there are a number of aspects to consider. For starters, you’ll want to consider the location of where you intend to wear and use the wetsuit. If you plan to Paddle board in Hawaii, you’ll be able to get away with a moderate wetsuit, but if you plan to ride the water in Northern Canada, a more robust wetsuit is going to be necessary. In addition, consider what type of wetsuit you want, either no sleeve, short sleeve, or long sleeve. Here, you’ll find all the information you need to buy the wetsuit that will keep you in the water longer and for the best price. Again, consider the area of the world in which you are doing to be entering the water. If you plan to visit warmer climates, you’ll likely be able to buy a less expensive wetsuit that doesn’t require an additional layer or thick neoprene material. However, if you like to surf or swim or scuba dive late into the season, additional coverage and thicker materials may be necessary to ensure your enjoyment even when the seasons change. For a long time, wetsuits were designed and manufactured for one body type only: slim. These days, wetsuit designers and manufacturers are incorporating all kinds of shapes and sizes into their lineup wetsuits. Not only can men of all shapes and sizes find a wetsuit to suit their body type, but there are wetsuits available for the entire family, from the smallest member to the tallest. There are several types of materials that are frequently used in wetsuits around the world. Neoprene is one of the most popular materials because it is easy to work with, it’s strong, and it can be used in a variety of applications. Less expensive wetsuits will be made of a poorer quality material, but if you don’t plan to do a lot of water activity or just need a wetsuit for a one-or-two time use in a warm climate, you can get away with an inexpensive model suit. You might want to try on a number of styles and sizes of wetsuits. Different types of wetsuits offer various styles and coverage. Some are sleeveless, short sleeve, long sleeve, or adjustable. Some can be removed and added for cooler weather. In addition, coverage extends to the legs: high-thigh, knee level, and ankle level wetsuits are available. Depending on where you will be in the water, and how long you plan to stay in the water, you’ll want to consider a thick or thin suit. For shorter periods of water play, thin suits might be useful. If you plan to be in the water for long periods of time or if you are unsure of the temperature, a thicker neoprene suit might be for you. When it comes to staying warm in your wetsuit, which you want to be able to do even in warmer climates, water needs to be able to get in and out of your suit without staying in key places. More expensive wetsuits will include thermal panels that will help keep you warm as colder water comes in and out of the suit as you enjoy your water sports and activities. A variety of stitching and finishing tapes are available in wetsuits for men. If you opt for a less expensive wetsuit, you can expect that the stitching will let over time – as with anything you buy that is less than high quality. However, if you only scuba dive or windsurf a few times a year, you can probably manage with a more affordable wetsuit. Watch for shoddy taping where neoprene has been “welded” together and could come apart. If they are secure, this “wet” taping can ensure your suit stays together, and water doesn’t get into the places it doesn’t belong. You’ll want to practice putting on and taking off your wetsuit. Zippers need to be good quality so that your wetsuit doesn’t break in vulnerable places, like where zippers appear, when you are getting into the suit. High-quality zippers are usually a good indicator of the quality of the suit overall. Test the zippers on and off your body and be sure to try it wet and dry to make sure it is accessible to you. Many wetsuits – almost all of them, in fact, offer a pulley system that is attached to the zipper so that swimmers, surfers, and scuba divers can get in and out of their wetsuits without assistance. More experienced athletes will want to invest in a quality wetsuit, while beginners can get away with a moderate or economically priced wetsuit. You’ll also need to think about performance requirements: if you plan to compete in triathlons, you’ll want a suit that moves with you, wicks away sweat, or promotes regulated body temperature. Other important considerations related to experience are based in how often you will compete in your wetsuit and the time between competitions for drying or returning to a comfortable temperature. When it comes to choosing the right wetsuit for you, you might also consider purchasing double or single-lined neoprene wetsuits, titanium-lined wetsuits, or wetsuits with reinforced knees and elbows where the most wear and tear can happen with extended use. As well, you’ll want to consider whether or not you’ll need to take the suit off yourself, or if you have to store your suit when traveling, how to wash your suit, and more. 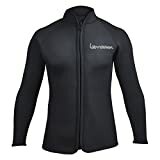 Now that you know some of the key elements to look for related to the best wetsuit for men be sure to check out all of the great options listed above and determine one that is right for you. Because of the wide variety of wetsuits options available today, men have more choice than ever when it comes to finding one that is right for them. Take your time to see what is going to work for you and your sporting needs. It’s never a bad idea to start with an economy or moderate level suit and work your way up to a professional fit and performance suit later in your water sporting career. Consider trying a variety of styles and fits to find one that suits your lifestyle and water sports addiction!